Eric started out pursuing a career in professional singing, but after hearing about the promise of advanced nuclear reactors, he decided to devote his life to saving and expanding the use of atomic energy. Larkin Mosscrop is an environmental biologist. She started her career in environmental remediation and found her way to Chalk River Laboratories where she learned about nuclear energy and how nuclear plays a key role in sustainable development and the fight against climate change. River grew up on Nantucket Island surfing, swimming, and sailing, he became interested in the issue of global water and sanitation access. After graduating with a degree in Energy Policy from University of Virginia, he moved to Barcelona, Spain where he works as a math and science teacher while completing a post bac in order to pursue nuclear engineering at the graduate level. David is a chartered physicist and experienced nuclear professional who has lived, worked and travelled in Europe, the US, Japan and Latin America. He sees clean, abundant and sustainable atomic energy as a vital tool in preserving our wild spaces for a future where humankind will be more numerous and prosperous than ever before. Bobbi is a nuclear engineer pursuing a PhD in nuclear engineering at the University of New Mexico. She became a nuclear engineer because she became interested in its important role in th climate change solution. She’s currently interested in developing pro-nuclear power legislation and political action to support and expand the commercial nuclear power industry. Art Wharton is the VP of Market Development at Studsvik Scandpower. Art's dedication to advancing nuclear stems from a desire to lift up impoverished populations and provide modern life to all, with minimum impact to the environment. Generation Atomic is a 501(c)3 non-profit organization, that works with its 501(c)4 political advocacy arm GAMMA (Generation Atomic Movement Mobilizing Alliance) to save today’s nuclear reactors and lay the groundwork for deploying the reactors of tomorrow. Since its founding in 2016, Gen A has worked to cultivate relationships with business leaders, pro-nuclear donors, and grassroots advocates. By engaging stakeholders at all levels, Gen A is working together with many partners to create a loud, effective, and sustainable pro-nuclear constituency. This community building is at the heart of Gen A’s grassroots organizing and advocacy. 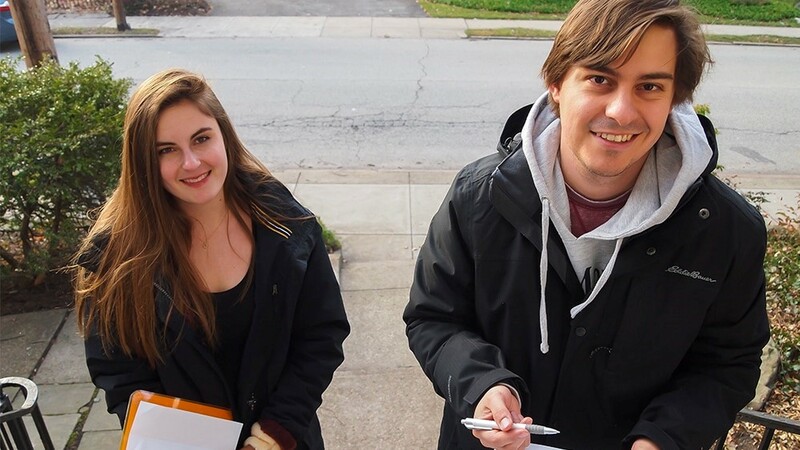 We accomplish this objective by combining the best of old school movement building -- door-to-door canvassing, community organizing, and advocacy trainings to identify and energize new nuclear supporters while empowering them with the best digital tools to make real change in the policy landscape. The facts are clear: nuclear power is the safest way to produce energy, the “waste” has the potential to power our future, and building nuclear is the fastest way to decarbonize a society. Indeed, the only countries that have decarbonized fast enough to limit global warming have done it with nuclear. Generation Atomic is here to tell that story, with your help, and take action at the local, national, and global levels to ensure we have a future of abundant clean energy - for everyone, forever. Generation Atomic is working to change the culture and build a movement to support nuclear energy. Here's what we've been up to. Gen A teamsup with the the Nuclear 4 Climate coalition at the climate talks (COP24) in Katowice, Poland to ensure that nuclear power is a key part of the decarbonization conversation. Gen A interviews a diverse cast of over 20 powerful people in the nuclear world as part of a grant project with the American Nuclear Society, Operations and Power Division. Working with the Nuclear Pride Coalition, Generation Atomic puts on "Nuclear Pride Fest" in Munich, Germany. The event is covered in the national media of Germany and the Netherlands. Eric roadtrips through South Carolina on his way to a conference and stops to interview community members impacted by the early stoppage of the V.C. Summer unit 3 nuclear project. 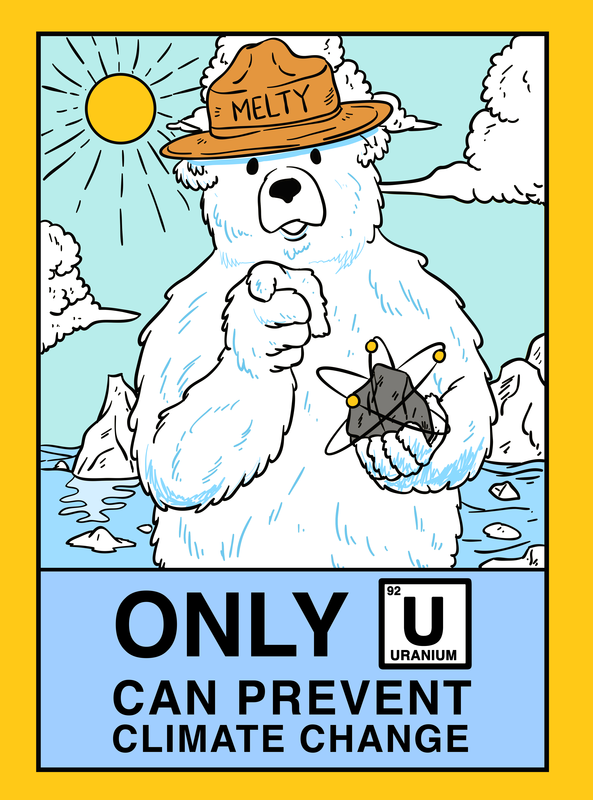 Gen A opens its online store and unveils a new mascot for Nuclear Energy, Melty the Bear. She's a mama bear that's working to spread awareness about the importance of nuclear energy for a better future for polar bears, and all animals. Gen A partners up with Mothers for Nuclear and Students for Nuclear to hold a nuclear communications training at Idaho National Lab. We throw a 50s themed party and film a music video at the first nuclear power plant in history, the Experimental Breeder Reactor - I. University of New Mexico Students work with Gen A to testify at an NRC hearing. Other than the representatives from Holtec, they were the only pro-nuclear people there. Gen A launches “Advanced” video series about the potential applications of advanced nuclear reactors. Generation Atomic debuts two new advocacy games, one at the ANS Student Conference in Florida, the other for hundreds of middle school students in Minneapolis. After hearing about Stanford Professor and 100% Renewables Activist Mark Z. Jacobson’s lawsuit against academic critic Christopher Clack, we knew we had to do something. 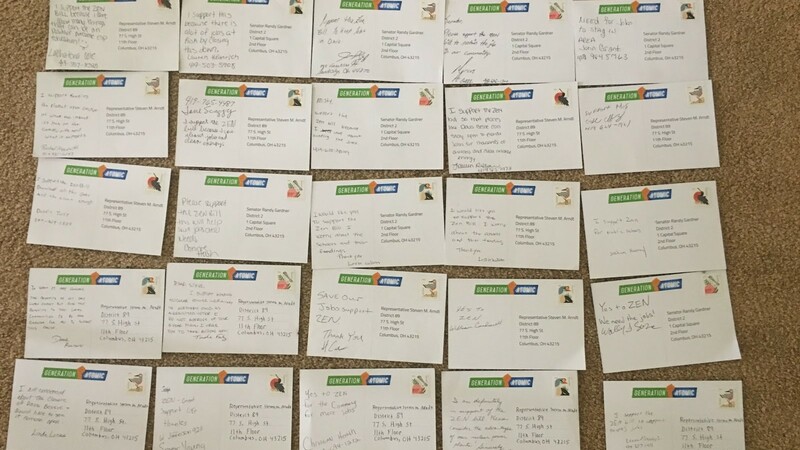 We started an online petition that gathered hundreds of signatures for Jacobson to drop the suit! And… he did! Generation Atomic returns to Ohio to promote and provide logistical support for the second Millennial Nuclear Caucus, hosted by NEI and the Department of Energy. The team spends a week on campus at Ohio State University organizing legislative visits, giving advocacy trainings, and connecting with hundreds of students. The Department of Energy features Eric and the work of Gen A in a promotional video. Gen A heads to Germany for COP23 to team up with Nuclear 4 Climate and a host of pro-nuclear NGOs from around the world. 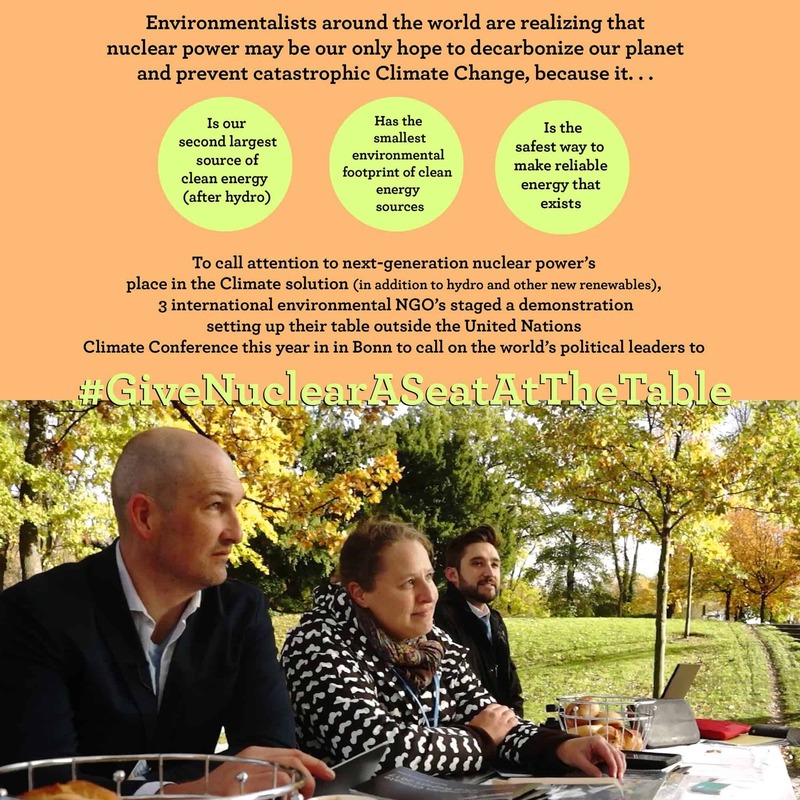 Sundance-nominated filmmaker Frankie Fenton documents "A Seat at the Table," a Generation Atomic-led, forum-style discussion at the entry of the Sustainable Innovation Forum, which had reneged on a sponsorship agreement with the World Nuclear Association. 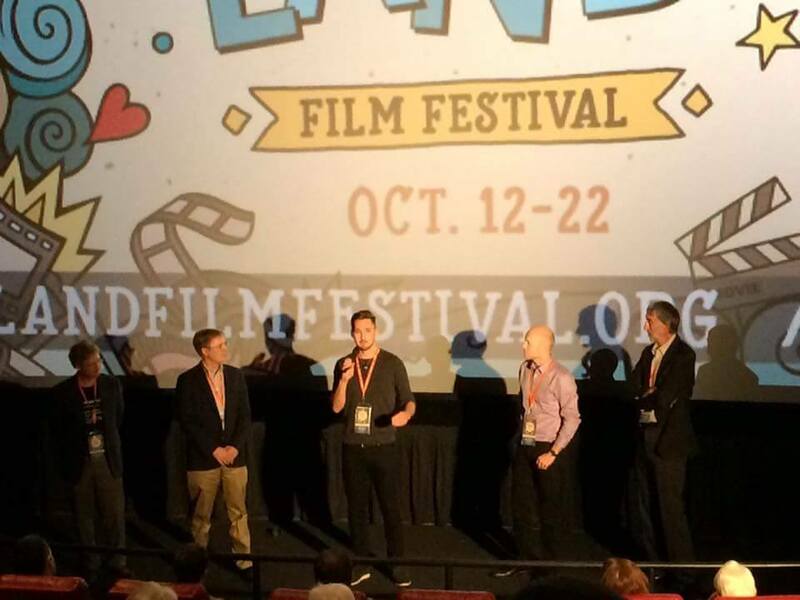 Generation Atomic organizes at the world premiere of The New Fire in Indianapolis, with special guests from the US Department of Energy. The film documents several advanced nuclear start-ups and features Eric singing opera about nuclear at the Paris Climate talks in 2015. Gen A concludes its campaign in Ohio after garnering more than 9000 actions and a contact list of more than 5000 Ohio nuclear supporters. The first annual "Davis-Besse Nuclear Power Station Car Show and Family Fun Day" is spearheaded by a Generation Atomic volunteer and brings 3000+ attendees to the plant. Generation Atomic launches its Ohio ZEN (Zero Emissions Nuclear) campaign to save Davis-Besse and Perry nuclear plants out of a cramped duplex in Sandusky, OH. After five weeks of grassroots, door-to-door campaigning in the OH 89th, Rep. Steve Arndt announces his support for the Ohio ZEN bill. Generation Atomic launches their mobile app, 'Atomic Action' at the ANS Student Conference. 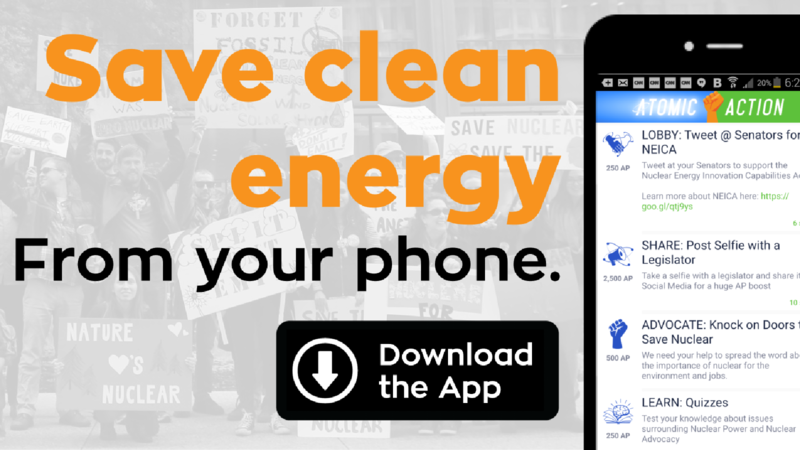 The app offers supporters the chance to take action on nuclear issues, and serves as the backbone of field operations. 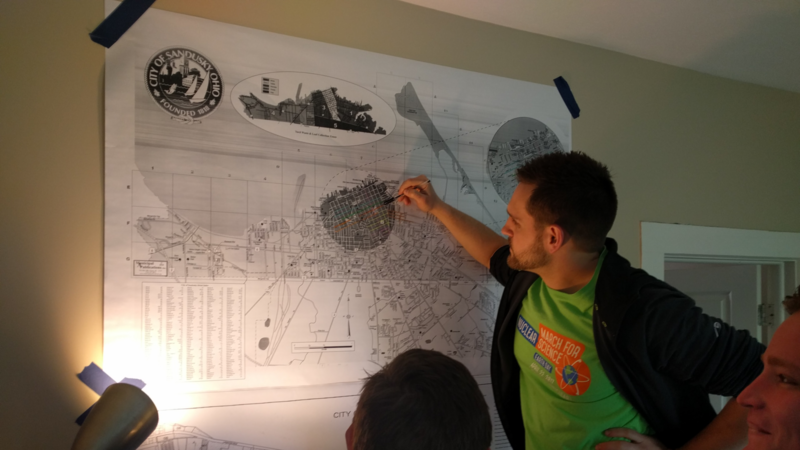 Generation Atomic cuts its teeth in nuclear advocacy by knocking on thousands of doors in Pennsylvania with a volunteer-led team of canvassers comprised of nuclear engineering and environmental science students. "Write your OH legislator urging support for ZEN"
"Petition UNEP to allow nuclear at the Sustainable Innovation Forum"
Eric and Tay found Generation Atomic, signing the Articles of Incorporation at the Lincoln Memorial in Washington, D.C.
Generation Atomic pilots its grassroots door-knocking model in Pittsburgh and State College, Pennsylvania. Part-time organizers and volunteer canvassers from Penn State make up the first Gen A Field Team. 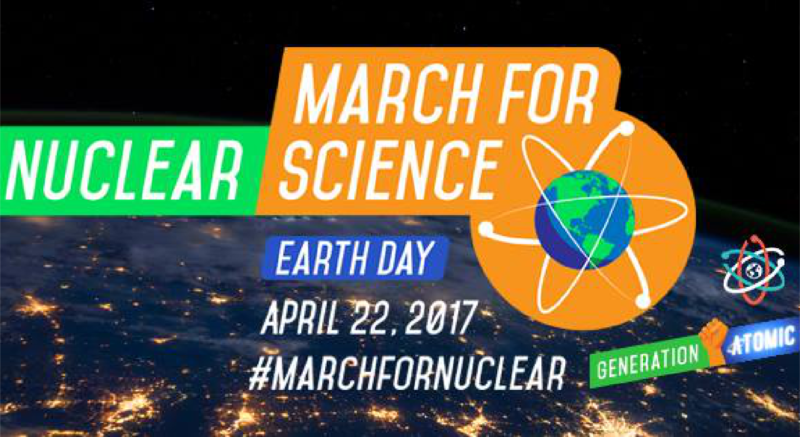 Generation Atomic leads the nuclear delegation at the highly publicized March for Science in Washington D.C.
Generation Atomic launches its Ohio ZEN campaign to save Davis-Besse and Perry nuclear plants out of a cramped duplex in Sandusky, OH. After five weeks of grassroots, door-to-door campaigning in the OH 89th, Rep. Steve Arndt announces his support for the Ohio ZEN bill. 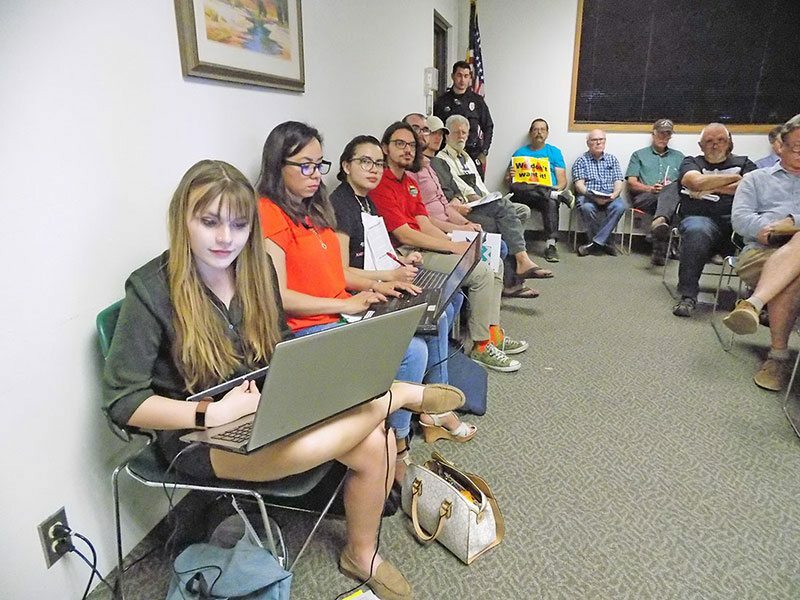 Generation Atomic expands its Ohio ZEN campaign to a headquarters in Akron, organizing in six counties across northern Ohio. In addition to canvassing, the team holds a series of "Think and Drink" events across the state, garnering hundreds of attendees. Gen A also logistically supports the "NUCLEAR: What it Means to Ohio" symposium held in Columbus and organizes at the Allen and Stark county fairs. In July, Eric speaks on the plenary panel at the National WIN Conference, inspiring a 21 year old student to ask her fellow audience members to contact their legislators and ask them to support nuclear. This action results in 1,300 emails to local and state legislators. The team concludes its campaign in Ohio after garnering more than 9000 actions and a contact list of more than 5000 Ohio nuclear supporters. The first annual "Davis-Besse Nuclear Power Station Car Show and Family Fun Day" is spearheaded by a Generation Atomic volunteer and brings 3000+ attendees to the plant. The bill that would save Ohio's two nuclear plants "HB 178" - which was originally introduced with only one sponsor - is re-introduced as HB 381-- now with sixteen co-sponsors. Tay and Sam attend the Millennial Nuclear Caucus roundtable meeting hosted by the US Secretary of Energy, Rick Perry. 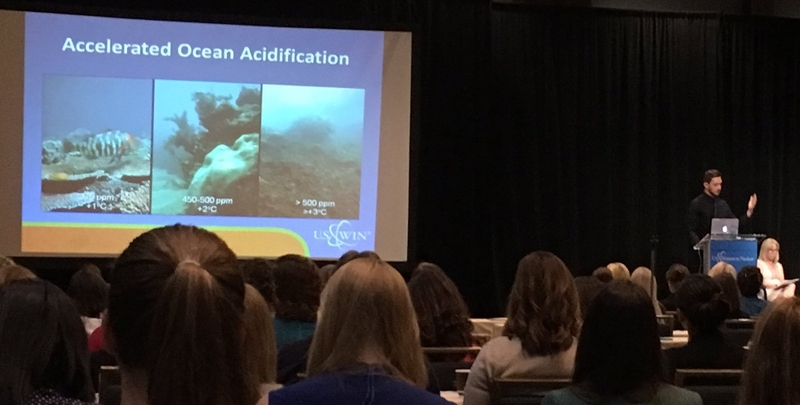 Tay and Sam also speak at the ANS Winter Conference. Gen A heads to Germany for COP23 to team up with Nuclear 4 Climate and a host of pro-nuclear NGOs from around the world. Tay, Eric, and Grant hold conversations at the group's booth in the Bonn Zone; Tay speaks at the official Side Event held at the Turkish Pavilion. Sundance-nominated filmmaker Frankie Fenton documents "A Seat at the Table," a Generation Atomic-led, forum-style discussion at the entry of the Sustainable Innovation Forum, which had reneged on a sponsorship agreement with the World Nuclear Association. Generation Atomic runs its first "Atomic Winter" fundraising drive, collecting contributions from nuclear advocates around the globe.